Modern, slim and functional, our Futura Slim Dustbin is unlike any other traditional trash bins. Featuring a compact and space-maximising design, this dustbin allows you to place it between tight spaces in your kitchen, bathroom or living room. Besides, it comes with a unique trash bag divider, helping you to separate your trash (eg. food waste and recyclables) if needed! Note: This item is on pre-order and will be delivered within 2-4 weeks upon ordering! Pre-order now to enjoy product reservation and priority shipping! Crafted with design elements inspired from Nordic areas, The Scandinavian Coffee Table will become the center-piece of your living room, eluding both quality and simplistic design. Available in a 2-piece matching set, bring home a touch of Scandinavian today! In love with Scandinavian designs? Shop our Scandinavian Collection! Crafted with the finest details and materials, our Luxe Remote Control Holder is the perfect organizer to keep your coffee table tidy! It stores away your controllers, pens, power banks and other smaller essentials effortlessly. Add a touch of quality and luxury to your living experience today! Great-looking and ultra-comfy, our Modern Floor Mat is the perfect companion for your living room, kitchen and bathroom! It features an absorbent top layer coupled with anti-slip padding on the bottom layer for added safety around the house! Introducing, the Premium Shoulder Messenger – our stylish and versatile bag! Whether you are going for a casual outing, heading to the office or embarking on your travels, the well-designed carrier is able to hold all your essentials in its spacious compartments. Light-weight and splash-proof, this bag protects your belongings from the elements! Not to mention, it has a unique center divider for added compartments and to keep your belongings organized! Use it as a messenger bag or a hand-carried carrier – it looks amazing both ways! Classy with a unique design, our Premium Prints Luggage Organizer (7pc Set) allows you to travel in style without the clutter! Light and compact, these organizers allows you to maximise your luggage space! A true essential item for every trip! Select your favourite design and say goodbye to messy luggages today! Bonus: FREE Shoe Bag for every purchase! (Total 7 pieces) Design of shoe bag will be provided based on stock availability. Have plenty of gadgets for your trip? Be it camera lens, extra powerbanks or cabls, our Essential Digital Organiser (LARGE) will be able to store them effortlessly? With 3 elastic bands on the inside securing your accessories in place, you can be assured that they are well-protected and neatly organized! Bring this along for your next holiday! Our Adorable Warmer Pouch (Small) is an amazing hot water pouch for your winter travel! Small, light-weight and portable, you may carry this warmer pouch effortlessly in your handbag. Great for warming your face and hands in winter regions, on the airplane or in the office! Make our Adorable Warmer Pouch your winter travel companion today! Need something larger? 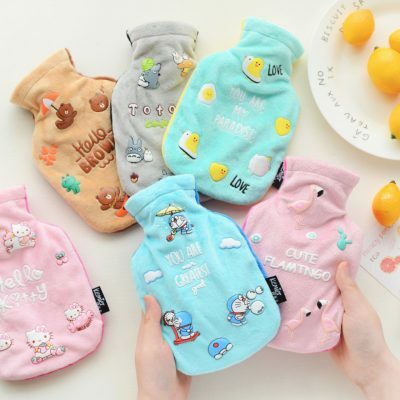 You might be interested in our Adorable Warmer Pouch (Large)! Protect your clothing and make laundry a breeze with our Everyday Non-Damaging Clothes Hanger! Slim, flexible and light-weight, it helps to reduce the wear-and-tear on clothing. Besides, the hanger comes with hanging hooks at the sides, perfect for hanging dresses, tank tops, lingerie and even ties! Add a new companion to your wardrobe with our Stack & Clip Clothes Hanger! As its name suggest, this unique hanger allows you to stack multiple hangers, thus saving precious closet space while improving accessibility. Coming in 3-piece set, it is a perfect organizer for long pants, jeans, shorts or berms!